OpenDAQ is an USB based measurement and automation device, which provides user with multifunction data-logging capabilities such as analog inputs and outputs, digital inputs and outputs, timer, counter and many more. OpenDAQ is an open source acquisition instrument, which allows users to customize their application in an unprecedented manner. OpenDAQ is intended to be a low-cost, open, and easy to use interface between your computer and the physical world. 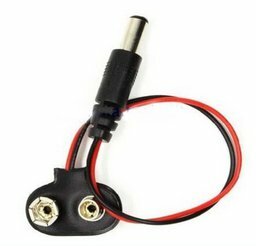 Clip and cable for a 9V battery (PP3) ending in a power jack. The kit includes one battery. The jack fits with the auxiliary power entry of openDAQ's labKit. You can use this clip to power the labKit from an external battery, and so execute your experiments anywhere you are.